This modern Spike Light table lamp is part of the Spark lights range. Formed from pleated and folded aluminium mesh with a turned and cast aluminium foot, it is one of the more unorthodox and most successful designs by Georgia Scott. She is a young, innovative designer of lighting products who experiments with a range of different materials. She conceived the design for this lamp in 1998 and it went into production shortly afterwards. This table lamp is constructed from pleated and folded aluminium mesh. It rests on a circular, cast aluminium base with a bevelled edge. 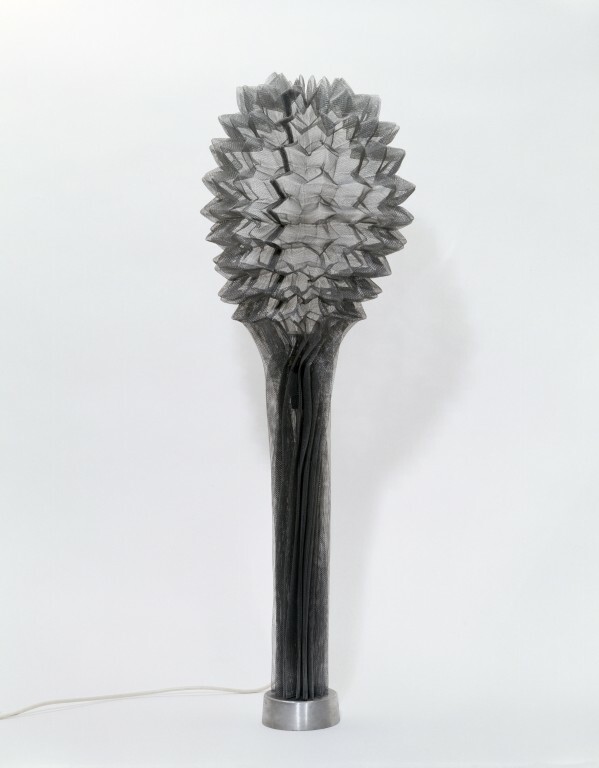 The structure of the is a stem of pleated folds rising to a star burst crown of folded points. The lamp which nestles in a fitting at the top of the stem is a sylvannia Hi Spot 50 E14 40W and is inserted through the circular aperture at the top. The electrical flex which is iserted through an opening in the base is white and incorporates an on/off rocker switch. 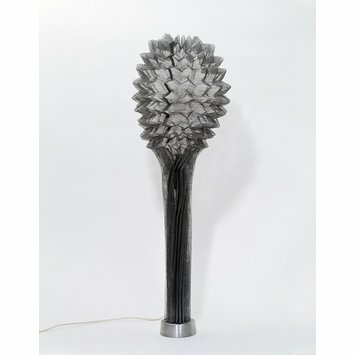 Spike Light, designed and made by Georgia Scott, London, 1998.